Indian activist Mahatma Gandhi once said that champions are made from something they have deep inside of them – a desire, a dream, a vision. One person who knows this well is three-time Australian Barista Champion Craig Simon who returned from the 2018 World Barista Championship (WBC) in June ranked seventh in the world. Naturally, Craig says there’s disappointment in his result given his countless hours of preparation and financial investment, but the result is yet another learning curve and another experience to add to his competition career, spanning more than a decade. For his routine, Craig took inspiration from the sommelier profession and developed a deductive tasting matrix that lets the drinker identify the provenance and quality of the coffee from the flavours they taste. Craig says he has now exhausted his routine concepts and has officially “hung up his competition boots”. He is now looking toward to the next step in his career, starting with the launch of Criteria Coffee, a dedicated space for baristas and café owners to learn how to roast under Craig’s guidance. Craig may be taking a permanent break from competition, but his mind is still filled with a decade of experience any barista would be smart to extract and utilise in their daily work or competition preparation. With the Australian Specialty Coffee Association (ASCA) regional championship just around the corner, taking place throughout September and November, Craig shares his top tips and methods of preparation that any beginner, regional, national, or international barista would find useful. A barista competition by ASCA standards is a test of skill. If you want to join the competition scene, its crucial you take the necessary time to learn the basics of coffee preparation, such as the ability to dial in a grinder, adjust a grinder, load a group handle, operate an espresso machine, produce an espresso extraction consistently, milk texture, pour, and manage workflow. You never want to get to the finals of a competition and have your technical ability let you down. Gaining these skills took me years to master and it will take a barista a similar amount of time to accomplish, but stay persistent. It matters. The format of the barista competition is to present four espressos, four milk-based drinks, and four signature drinks to a panel of judges. More than just serving drinks, you need to present a good idea or a concept. You need to have something to say, whether that be your personal journey, an origin experience, how you discovered an amazing coffee, a new processing method, or a new technology. All of these are relevant, but my recommendation is to present something that’s really important to you as the ideas will come across the most powerfully to the judges. Of course, people who have been working in the coffee industry for 10 years will have more knowledge and experience than those who have just started out, but don’t let that deter you. Think about how can you use your three beverage courses to demonstrate and support your concept. The true value of competing is learning and gaining new skills. Winning is a bonus. Read the rules back to front. You don’t want to throw away points unintentionally because you didn’t understand what the rules were. The technical score sheet is a good starting point. It’s not an interpretative dance, it’s black and white. 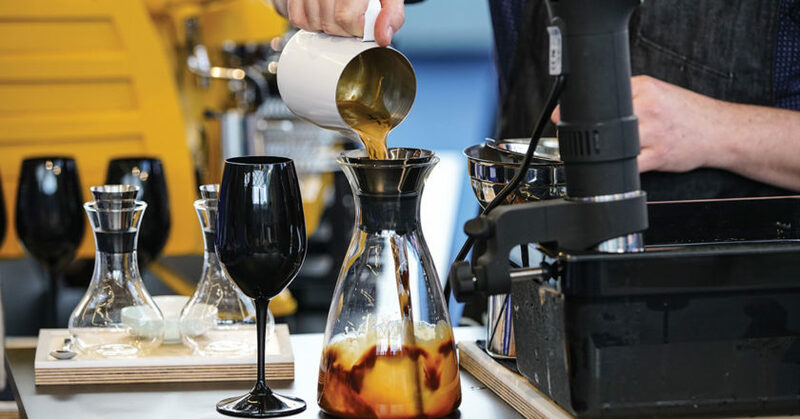 You can present the most inventive way of making coffee but if it’s not neat, tidy and to the judge’s requirements, you’ll throw away lots of points unnecessarily. Every top-flight barista who has made finals and won nationals have all mastered and perfected making coffee. I can guarantee they also know the sensory scoresheet like the back of their hand. The only thing you need to do is make sure you have prepared thoroughly. Don’t step on stage knowing you could have spent a bit more time practicing some element. You’ll be sure to come unstuck. If you can walk off stage and honestly tell yourself you prepared the best of your ability and did your best, then you’ve won whether you place first, fourth, or last. Everyone learns differently but you need to learn how to study effectively. Some people learn better with 12 hours a day of intense training, others five hours, some just two, and that’s completely OK. Training is not just practical. I used to do one to two hours of physical practice and six to 10 hours of visualisation and mental practice (kinaesthetic learning). You don’t need to be behind the machine to learn as long as you can vividly picture your workspace when you shut your eyes. The key in training is how to maintain your energy while still refining and polishing your routine, and getting excited about what you’re doing. While I don’t think it’s absolutely crucial to have a coach, I definitely chose to compete with a coaching team from 2014 onwards. I enjoy the support, assistance, and comraderie of being part of a team. When I was competing against Matt Perger in 2013, I watched his success with having a coach, so for the 2014 competition I asked Pete Licata and Holly Bastin join me as coaches, whom I have collaborated with ever since. My coaching team was probably the single greatest cost of my WBC preparation. It’s not an essential requirement of competing, but I’m dyslexic and can’t write scripts, so my coaches helped me convert my ideas and ramblings to a cohesive speech. As a bare minimum it is worth having a friend, barista, or perhaps a friendly (retired) judge observe. It’s difficult to get a feel for how your presentation is received from the judges’ perspective while you practice. as always something I remember from one of my early music teachers. Throughout my competition career people have told me to “amp it up”, but I don’t think you necessarily need to. Being overly expressive and unnatural in your delivery can bring a lot of people unstuck because it comes across as forced or fasle. Consider how your energy level and expression matches the tone of what you’re trying to present, and adjust accordingly. Do what’s natural for you to be charismatic and engaging. I think Irish Barista Champion Colin Harmon is one of the best examples of this. Nerves are natural but what happens if something goes wrong or you forget what you want to say? Like we musicians say, get on with the show. When I compete I try and remain “in the moment”. This means just focusing on what you’re doing right now. Don’t look forward or backwards or try to analyse or judge what you are doing, it will just pull you away from bringing your best and engaging. This means, however, unless you record your performances, you won’t remember what you did. Watching back afterwards can be an excellent way to learn so you can just let go and perform on stage. Rest assured you will make mistakes, forget words (please not your tasting notes though), spill stuff, and otherwise not be perfect. Clean up your spills, keep smiling, and don’t worry. The judges don’t know what you forgot to say unless you give it away. It’s easy to get in a toxic pattern of sleep, train, repeat, burn out. Balance your training with things you enjoy, such as spending time with family, friends, your kids, or playing music (or whatever floats your boat). Finding that balance is key. Don’t go into a competition only wanting to win. There’s a lot of talent out there but realise what you will learn from the experience. Over the past 18 years since the competitions were invented, the modern Australian coffee culture was born out of the barista skills we present on stage. There is no greater test than putting yourself on the line to have the judges assess how you’ve done. Whether you make a local competition, ASCA nationals, or worlds, it’s absolutely worth finding out what you’re capable of.